It's a new year, so it's a perfect time to discover a new fragrance. Well, frankly I can justify anytime to discover a new beauty anything, but I digress... 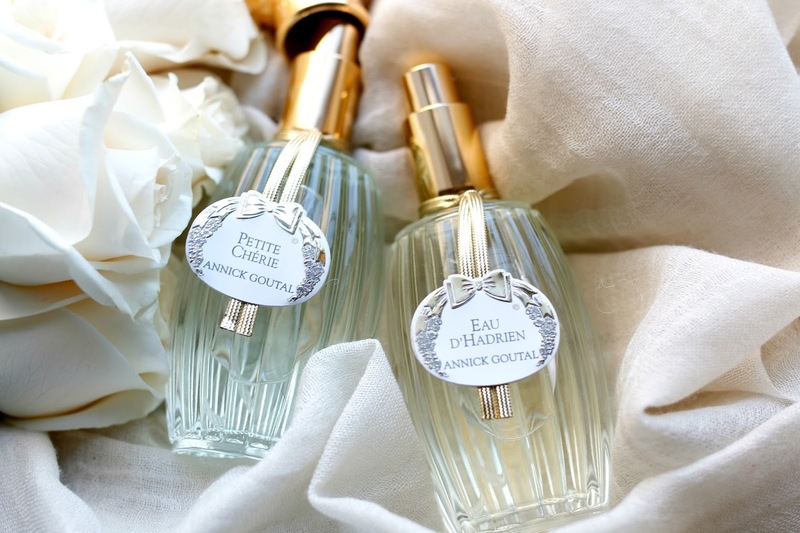 I have admired Annick Goutal fragrances from afar for years simply because the packaging is always so delicate and feminine, but never had the chance to smell any of the scents. And because there are so many to choose from, it can be hard to decide where to begin. For myself, I always ask for the star products or cult classics from a brand I am new to because there must be a reason why it is such a popular item. In this case, both Petite Cherie and Eau d'Hadrien are two signature scents from the Annick Goutal line so I started with these. Annnnnnd as usual, my approach to a new brand worked again because I instantly fell in love with each scent. 2. Eau d'Hadrien - Citrus based scents dominate a large portion of my fragrance collection because they always smell so fresh and clean. I didn't even need to read the notes in this one because from the first spritz, the citrus notes were prominent. Sometimes with citrus fragrances, the scent can take on a sour quality or the citrus aspect can smell synthetic. Not in this case. Eau d'Hadrien smells like pure lemons and grapefruits - as if you bottled the actual fruit. Once the scent begins to dry down, notes of bergamot and cypress add a woody base which gives it more body than a typical citrus fragrance. I do love wearing my bold and spicy scents in the winter, but I have been gravitating towards this over the past month because it lifts my mood despite the cold weather. Nothing puts me in a better mood than a warm shower followed by a fresh citrus scent to wake me up. If you are new to the Annick Goutal line, I would highly recommend beginning with either one of these scents. Both are so easy to wear and contain notes that wear well and would appeal to many different fragrance lovers. Plus the bottle looks stunning on a vanity and that is just as important, right?